Developmental Cognitive Neuroscience is an interdisciplinary field devoted to understanding how children’s minds change as they grow up, interrelations between that and how the brain is changing, and environmental and biological influences on that. Our lab specializes in studying a region of the brain known as prefrontal cortex (PFC) and the cognitive abilities that depend on it called executive functions. Executive functions include 'thinking outside the box' and flexibly adjusting to unexpected change (cognitive flexibility & creative problem-solving), reasoning and mentally playing with and relating ideas and facts (working memory), and giving considered responses rather than impulsive ones, resisting temptations, resisting distractions, and staying focused (self-control, discipline, & selective attention). To study their neural bases and modulation by genes and neurochemistry, we use functional neuroimaging (fMRI) & molecular genetic techniques. To study their modulation by the environment, we look at detrimental factors such as poverty or stress, and we look at facilitative factors such as school programs, and hope to start looking at the possible benefits of dance, music, and storytelling. We offer a markedly different perspective from mainstream education in hypothesizing that focusing exclusively on training cognitive skills is less efficient, and ultimately less successful, than also addressing youths’ emotional, social, and physical needs. "What neuroscientist Adele Diamond is learning about the brain is turning some of our most modern ideas about education on their heads. Her work is scientifically illustrating the educational power of things like play, sports, music, memorization and reflection. What nourishes the human spirit, the whole person, it turns out, also hones our minds. My thinking about the education I received, about school testing, and about what I want for my children will never be the same after the conversation I had with neuroscientist Adele Diamond." Click Here Want to optimize executive functions and academic outcomes? Simple, just nourish the human spirit. 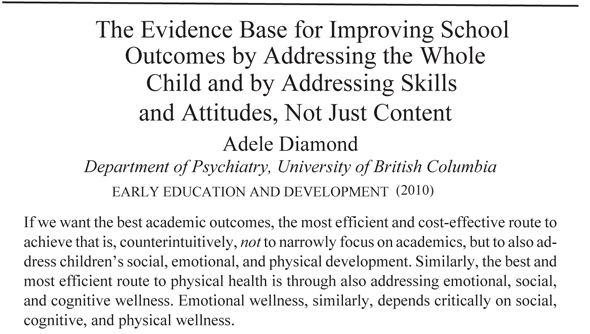 Our 2011 Science paper (Diamond & Lee 2011) reported that surprisingly diverse approaches (including yoga and traditional martial arts) apparently can improve children’s EFs & PFC function. Detailed information appears in the Tables in Supplemental Online Materials. Click Here The evidence base for improving school outcomes by addressing the whole child and by addressing skills and attitudes, not just content. Diamond, A. (2010). Early Education and Development, 21, 780-793. We demonstrated that ADHD that is primarily inattentive is fundamentally different from ADHD of the hyperactive or combined type -- with different genetic and neural bases, cognitive profiles, responses to medication, and patterns of comorbidity. This resonated deeply with patients and clinicians. The number of websites devoted to ADHD-inattentive rapidly rose from 4 to 1,000’s and treatment for ADHD-IA has correspondingly changed. Click Here One line of our work has led to worldwide changes in the medical guidelines for the treatment of a genetic disorder (PKU) that improved many children’s lives. Click Here We've documented marked advances in executive functions due to an early childhood school curriculum (Tools of the Mind) that requires no specialists or expensive equipment, just regular teachers in regular classrooms. The children who spent more time in social pretend play outperformed their peers who received more direct academic instruction. We are following this up with a larger randomized control trial in British Columbia. Click Here In 2004, we reported evidence of the relation between a genetic polymorphism and EF performance in children that challenged accepted notions of the role of dopamine in prefrontal cortex. Click Here In 2002, we showed we could halve the age at which infants can demonstrate the ability to deduce abstract rules. Our pilot work indicates that this also works with children with autism. The implication is that children with autism may be able to grasp abstract concepts long thought beyond their ability; the information just needs to be presented to them in a way they can understand. 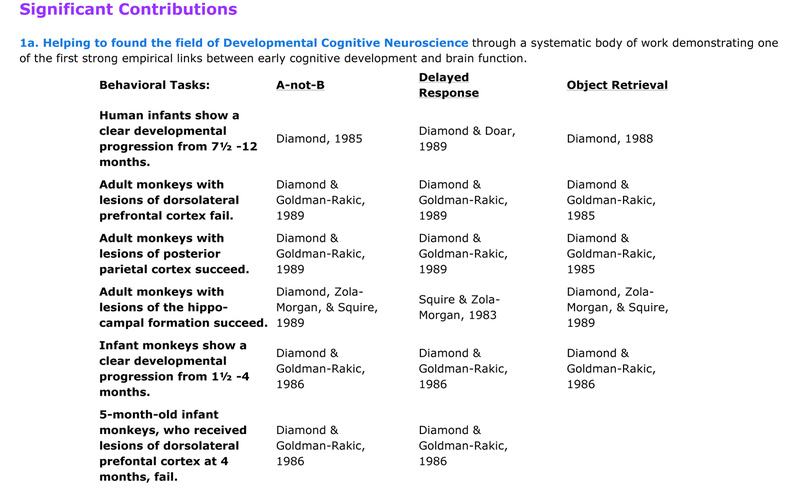 Click Here Our earlier work demonstrated one of the first strong empirical links between early cognitive development and brain function, and was instrumental in beginning the field of Developmental Cognitive Neuroscience. Every 2-3 years, we organize a conference to help children by bringing research findings to parents, teachers, doctors, and others. Attendees LOVE it! Click on the photo above. Click on the photo above. Click on the photo above.